Tony Todd, Kelly Rowan, William O’Leary, Bill Nunn, Matt Clark, David Gianopoulos, Fay Hauser, Joshua Gibran Mayweather, Timothy Carhart, Veronica Cartwright, Caroline Barclay, Michael Bergeron, Brianna Blanchard, Young Caroline , Clotiel Bordeltier, Russell Buchanan, Nate Bynum, Sandy Byrd, Eric Cadora, Carl Ciarfalio, Michael Culkin, Stephen P. Dunn, Daniel Dupont, Glen Gomez, Steven Hartman, Margaret Howell, Ralph Joseph, Erin Labranche, Carl Leblanc, George Lemore, Maria Mason , Monica L. Monica, Brian Joseph Moore, Randy Oglesby, Steve Picerni, Eric Pierson, Terrence Rosemore, Amy Ryder, Patricia Sansone, Hunt Scarritt, Carol Sutton. 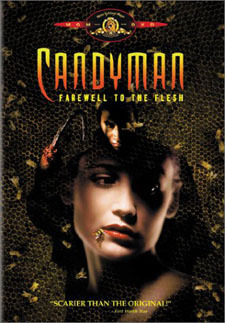 Set in New Orleans at Mardi Gras Candyman II: Farewell to the Flesh is more of a standard slasher horror flick than Bernard Rose’s original, Candyman. Directed by Bill Condon who has made a career in horror and sci-fi films and again starring Tony Todd as a very effective Candyman, this film offers a lot more blood and gore and possibly more thrills than its predecessor. Philip Glass’s chilling score is highly effective as the cues from the first film were reused and edited along with some new compositions and themes that Mr. Glass contributed to the sequel. Polygram Film Entertainment presents a Propaganda Films Production. Produced by Clive Barker, Tim Clawson, Gregg Fienberg, Anna C. Miller, Sigurjon Sighvatsson. Original Music by Philip Glass. Screenplay by Rand Ravich and Mark Kruger. Cinematography by Tobias A. Schliessler. Film Editing by Virginia Katz. Production Design by Barry Robison. Art Direction: Dawn Snyder Stebler.